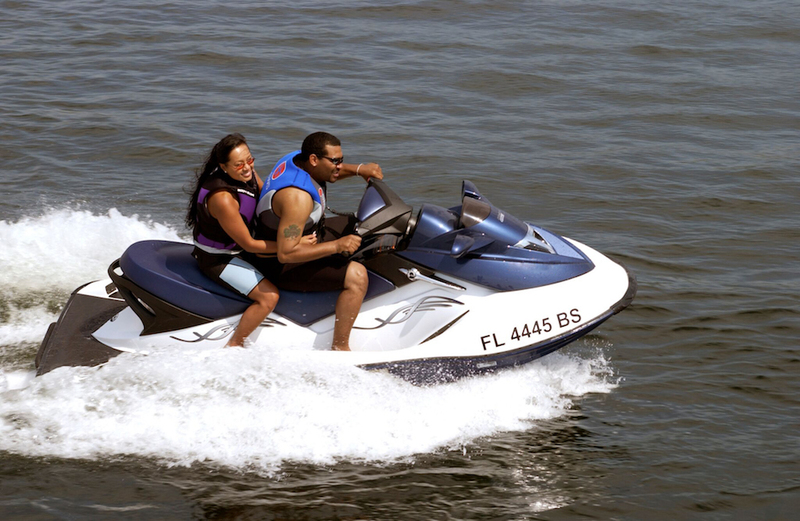 The official definition of personal watercraft (PWC) varies from state to state, but they are generally recognized as a vessel which uses an inboard motor powering a water jet pump as its primary source of motive power. The vessels are designed to be operated by a person sitting, standing or kneeling. PWC are manufactured by BRP (Sea-Doo®), Kawasaki (JET SKI®), and Yamaha (WaveRunner®). Water jet devices (WJD) include JetpaksTM, JetlevsTM, FlyboardsTM, JetovatorsTM, HydroliftTM, and JetsurfTM, and other similar devices where individuals ride a hydro-powered apparatus above the surface of the water while connected to a PWC or other power source that supplies thrust to the WJD through a hose connecting the two devices. When the PWC and WJD devices are connected they are considered to be one vessel. According to U.S. Coast Guard figures, over 99 percent of PWC are enjoyed accident-free every year.